After your list is imported, you’ll be taken to the List Summary page. This page shows the current state of your list and the number of people who will receive your campaign if you use this list. Why were some subscribers not imported? After you've imported a list into WordFly, you'll be redirected to the List Summary page. 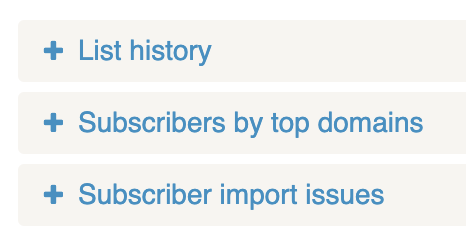 At the top of the summary page, you'll see how many subscribers were successfully imported into your list. You'll also see the number of subscribers that were not imported. Subscribers who were not imported have some sort of issue that suppresses them from the final import. Subscribers who were not imported These subscribers are suppressed due to an existing issue like an existing unsubscribe event, an invalid address, a data error or the address is a duplicate in the list data. Subscribers who opted-out of the list or manually unsubscribed These subscribers reflect the number of hard bounces in the existing list and any new hard bounces or unsubscribers that come in from the campaign that used this list. Under the List History section, you can see all the duplicates not imported. Under the Subscriber Import Issues section, you can see all the hard bounces, unsubscribes, invalid addresses and data errors for addresses not imported. Under the Subscriber Import Issues section, click the Export button to receive a full report of issues including abuse complaints. You can also view the List Summary page after a campaign has been sent. The number of Subscribers who opted-out of the list or manually unsubscribed are updated to show the number of abuse complaints, hard bounces and opt-opts we received from your subscribers. In the next section we will review more about why subscribers are not imported. There are a few reasons why a subscriber might not make it into the final subscribers who are currently in your list. 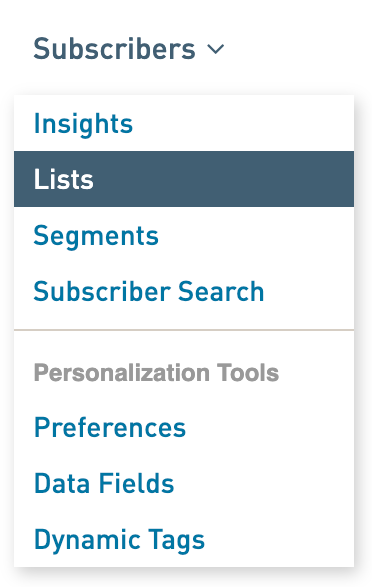 The total subscribers not imported will appear at the top of your List Summary page. DUPLICATE If there is a duplicate address in the list, WordFly will only import the first address. Duplicates show up under List History. Learn more about duplicate handling. If the subscriber has a hard bounce associated with their address, WordFly recognizes it as an invalid address. Hard bounces show up under the Subscriber Import Issues section, click on the Hard Bounces tab to review all the addresses with this issue. Learn more about hard bounces and more on how to manage hard bounces. 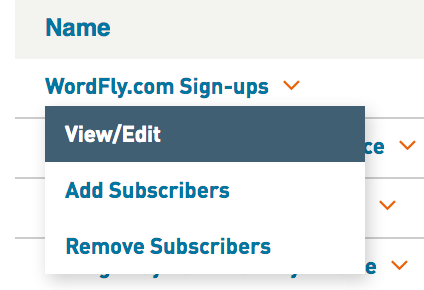 OPT OUT If the subscriber has an opt-out associated with their address, WordFly recognizes the unsubscribe status. Opt-outs show up under the Subscriber Import Issues section, click on the Unsubscribes tab to review all the addresses with this issue. Learn more about how to manage unsubscribes in your account. ABUSE COMPLAINT If the subscriber has an abuse complaint associated with their address, WordFly recognizes the unsubscribe status. Abuse complaints do not show up under the Subscriber Import Issues section. You must click the Export button under the Subscriber Import Issues section to download a full report that includes abuse complaints. Learn more about abuse complaints. DATA ERRORS If there are any data errors with the subscriber's information in your list, WordFly will not be able to import those addresses successfully. For example, "Email address missing" is a typical data error. Data Errors show up under the Subscriber Import Issues section, click on the Data Errors tab to review the issues. This tab is capped at 20 errors. In the next section we will review how to override list import issues. You can override a few import issues after importing your list. Hard bounces, Unsubscribes and Invalid Addresses can be overriden for subscribers in any list. Proceed with caution! These suppressions are in place to help your deliverability. For example, sending to hard bounces can land your emails on a blocklist. Or sending to unsubscribed addresses can lead to abuse complaints which can then lead to emails being blocked. 2. Select a List and click "View/Edit" to open it. 3. Scroll down to the bottom of the List Summary page and open Subscriber Import Issues. 4. Click the checkbox by the subscribers address and use the Actions dropdown to select an override option. You can “Override for this list only” or “Override for this subscriber”. Either option will get this subscriber back on your mailing list and the subscriber will show up under Overrides. Use “Override for this subscriber" when you want to permanently remove the flag from the subscriber's record. You can export your list import issues into a spreadsheet for each reviewing. The import issues export file will contain any unsubscribes, hard bounces, invalid addresses and abuse complaint addresses from your imported list!